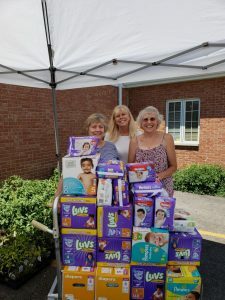 The Geneva Lake Women’s Association successfully coordinated a major “Diaper Drive” in July of 2018, collecting 1430 diapers! In Walworth County, Wisconsin, an estimated 44% of families suffer from food insecurity and intermittent hunger during year. According to the 2016 US Census Survey, there are 989 children under 5 years old living at or below the poverty level in our community. Disposable diapers are a critical need for a family and for babies. An insufficient supply of diapers can cause a family to spiral deeper into poverty and distress. Most childcare programs require parents to provide diapers, so parents without sufficient diapers cannot leave their children in childcare to attend work or school. Most Americans who have not faced this struggle do not know the problem exists. Many do not realize that funds received under federal programs such as “SNAP” (formerly known as ‘food stamps’) and WIC cannot be spent on diapers. 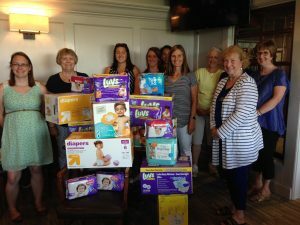 The efforts of the Geneva Lakes Women’s Association, along with other local groups, have assisted the Walworth County Food Pantry to form a new division, The Walworth County Diaper Bank to focus exclusively on providing disposable diapers to those in need. The National Diaper Bank Network recognized The Walworth County Diaper Bank, http://nationaldiaperbanknetwork.org/ as a member partner in August 2018. There is no other Diaper Bank in Walworth County and The Walworth County Diaper Bank’s goal is to partner with other local agencies in need of diapers to become a reliable source, not only to the parents who visit the pantry, but to include agencies who have clients in need.